For many years, I spent time with my Abuelos. I remember how much I loved to go to their house in Redondo Beach as a little kid. My parents would go out on the weekends and they would leave us (my brother, sister and I) with them. We would get so spoiled. Pretty much got to do whatever we wanted. They would let me stay up so late to watch a Mexican show which show cased “La India Maria”. I loved that time. But once we saw the lights of my parents’ car creep up, they would tell me to run and get under the covers. There was a season when they lived in Tijuana, B.C. and we would visit them almost every weekend. I loved heading out to the border. I was not allowed to have candy (my parents were health freaks). Buuuuuut when I was with my grandparents, I could have as much candy, chips, and soda as I wanted (granted I was sick to my stomach for days at a time). My Abuela, my aunt (who is 1 year younger than me) and I would take long walks to the store in the evening down dirt roads. I can still smell the dirt as the neighbors cleaned out there porches with water. There were so many dogs in TJ. I remember always being so scared. But my Abuela always would tell me to say something that I faintly remember. It went something like this, “Dios en mi…” Well, that’s all I remember LOL! As I grew into a teen and began to drive, my Abuelo would let me borrow the car and my aunt and I would drive to Down Town TJ! It was kind of safe then. We would visit the museum called, La Bola (not sure if that’s the real name). We loved to go walking around a market called, Miguel Hidalgo. Most of the time we wouldn’t even buy anything. We just liked to head out. I have so many awesome and funny memories of my times in Tijuana that I will write about soon. But there was a time where I was going to college, and working 2 jobs. Soon after I got married and time with my Abuelos was rare. My Abuelo was still alive during that time. But he started getting sick. I remember when he passed away, I took a big hit because he always moved me to think big. He was a tempered man but one of the funniest men I knew. I loved to joke with him and listen to him repeat the same jokes. He always had jokes. He would nick name everyone even if they didn’t know it. Part of who I am I see it’s because of what I saw in him. His joking, his love to talk and story tell. I see that in me. I went into radio for a while because I was intrigued as I would watch him record himself talking into a mic at all our gatherings or parties. He sounded like a radio announcer. So as a kid, I would do the same thing. I made my own novelas and created my own sound effects out of whatever I had in sight and record them. He was a character. I look back and think, “How could I have been so careless and not have given them the time that they deserved. Looking back it wasn’t so much that my life was soooo busy (even though I felt like it was). I know I could have made more time to spend quality time with them. But I didn’t. Maybe because I was young and selfish. Maybe because I thought there were far more important things to do. I’m not quite sure. I feel so blessed to still have one remaining grand parent and be able to spend that quality time that I once had as a kid and now get to enjoy as an adult and with my own children. Once the generation of our grandparents is gone, we will no longer have first hand information of our ancestors, our culture, our lingo, our traditions and our food. We will only be able to read about it and watch it either on TV, YouTube or any other media form. I just want to encourage this generation. If you have your grandparents still; take advantage of it. They have so many hidden treasure that will only be seen by spending time with them. You will hear crazy stories about them and their families, old school sayings, secret recipes and so much more. Maybe you can’t spend time with them because of distance or “XYZ” but there are other ways to communicate. Give them a call. You won’t regret it. 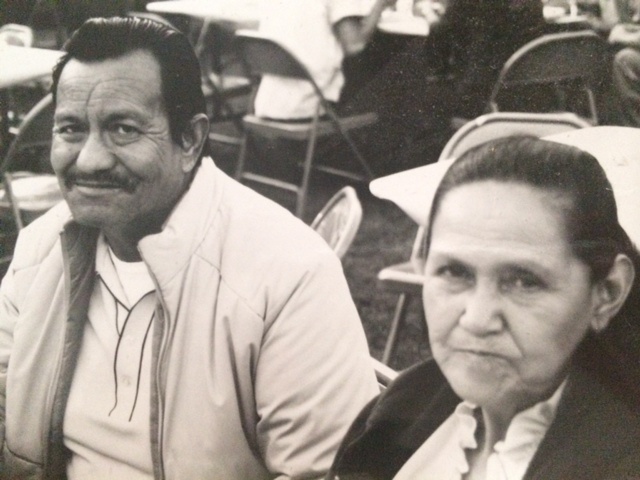 For those who have lost your abuelitos and miss them, my heart is with you. May God’s peace rule over you today. 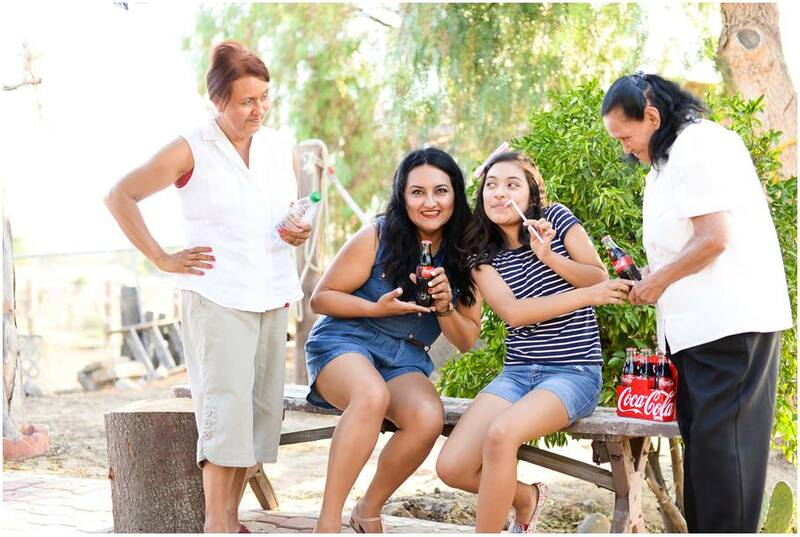 Since my daughter was born 12 years ago, I have had the privilege to say that I am part of 4 generations of women whom have been the first born of the family. What ‘s even more amazing is that the 4 generations are still alive. My Abuela was the first born, my mom (Abuela’s daughter) was the first born, I’m the first born and my daughter is also the first born. It is so special to me to be able to share that with all of you. God has granted me such a great blessing to be able to enjoy something so marvelous. 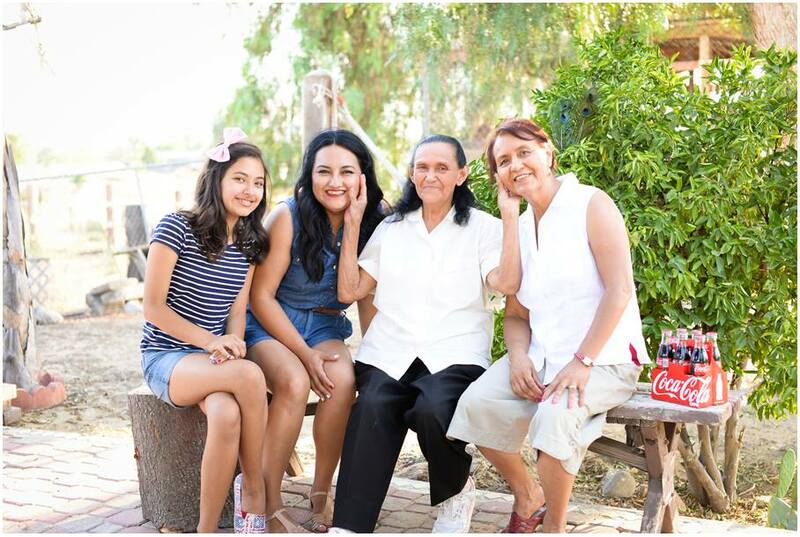 Although my mom and Abuela seem so humble, meek, submissive and nice they are powerhouses! One would think that because of all the hardships they have had to face, they would be defeated women. But they are not. They have managed to get up and continue life… with smiles and laughs. In one way or another, the 4 of us have inherited many similar traits. We have the natural “1st born” syndrome, which is obvious with our “people pleasing” behavior. The one that is the most notorious for that is Abuela. She is a human form of a cameleon–taking any shape or form just to make sure no one gets offended, hurt or feel left out. She will give you her last dollar and even her last Coke just to make you feel good. If you meet her be ready to be part of the family. My mom is just like that (especially when it comes to her kids and grandchildren). For example, once she gets the phone call that “we are on our way” (going over her house), she jumps to the kitchen to have something ready when we arrive. It could be anything from delicious ice cold lemonade to a full on gourmet salad. Notice I said salad. That’s because she is a health freak. Growing up she never bought us cereal that had sugar. Man that was stressful! LOL! Anyway, I’ve been a healthy adult for the most part. I probably owe it all to her. It is the heart of a loving mother, always wanting to give others the best of what she has to offer. As I write, I’m laying here thinking, “How do I fit into the “1st Born” syndrome. I guess it’s hard to talk about ones self. Just like my mom and Abuela, I’m a worry wart. I think of every possible negative scenario and play it out in my head over and over again. I worry about everyone and can’t rest until I either get a text or send some “random text” about anything just to see if they are okay. So either they passed that down to me or it’s just part of being 1st born. My daughter is also a people-pleaser. She is always trying to do the right thing to make mom and dad happy. She definitely is a leader in her own little way. She isn’t afraid to take risks but not on account of hurting those around her. She has a mind of her own and is very opinionated but always trying to say things in the nicest possible way. When it comes to her friends, she will do anything to make sure they are happy (I’m like that too). She is the best friend you can have. I can’t tell you enough how honored I am to be part of this heritage. The ladies in my life aren’t flashy, eccentric nor women who need and want the best of everything. They do with what they have. They aren’t domineering women who make you do what they want. They would rather YOU do what you want. They aren’t women who give up. Nor will they let YOU give up. They are humble, meek, simple yet strong women whom with a smile will lift you and encourage you to be the best that “YOU” can be. I can only pray that my daughter and I inherit a portion of what they are. They are an inspiration to me and to those around them. And for that I honor them.